How did you first get into Bob Dylan? How has he influenced your music? Dylan has made me understand that a song is the place words and music and the voice all come together to make a particular sound that is evocative to a listener. The word without the music, the music without the word or either without the identity of the voice singing it would not have the same expression. Bob Dylan’s singing and performing shaped my mind and what I believe in. He has influenced anything I’ve ever sung. How many times have you seen him play live? What were those shows like? I’ve only seen Bob Dylan play live eleven or twelve times. My best friend laughs at me – he’s seen him over a hundred. My favorite Dylan show was at Tramps in NYC. It was small — I think Tramps held about 400. It was a show in between stadium shows. My friend Kevin and I stood in line for a day-and-a-half to get tickets, and another day to get in. We were fourth row in the center. It was the most inspiring show I had ever seen. Everybody had made a huge effort to be there, so no one was talking. Every person listened to each note. The listeners are as much of what makes a great show as the players. I think there were six encores. Elvis Costello got up and sang “I Shall Be Released” with Dylan. I will die remembering that song being sung. The next day I heard Elvis Costello on the radio talking about it and he said it was the most amazing musical experience he had ever had, or something to that effect. Did it take you a while to get into Bob Dylan, given his strange singing style? No. I remember noticing that he sounded different from others, for example Frank Sinatra or Robert Plant. I was immediately taken, because of what he was saying. There are times the intention in his voice is like having someone stick a hand into your chest and grab the breath out of your lungs. What’s the closest you’ve ever gotten to him? In the late 90s I wanted to put “Forever Young” on an album of live shows I had compiled called Not Around Town, songs I’d performed in Italy, Israel, Sweden…I sent it to the person responsible for Bob Dylan’s publishing. A few weeks later I got a call that his manager heard it and Bob Dylan had heard it and he was going to come see a show. I was shocked. I scrambled to make sure the show was going to be perfect. I didn’t expect it to actualize, but I was excited that it could. The day of the show I received a very kind call that he couldn’t come because of a rehearsal, but he generously invited me over to play some songs during the day. I sat with him, one-on-one for about an hour-and-a-half. He was so kind. My stomach wouldn’t stop shaking anyway, but he did everything he could to put me at ease. We played songs together. We sat there knee to knee and he soloed on one of my songs called “Summer Waters.” I really could not believe — and looking back still can’t believe — that it happened. Bob told me he really liked my songs, especially one called “Roof Jumping,” and those words from him have always kept me going. Dylan was professorial. He checked my knowledge of music. I was lacking. My experience with music before meeting with Bob was writing and playing. I spent little time listening. After I met with him, I listened to an album a day. I got the Harry Smith Anthology. Everything changed. Bob also noticed on the back of my record there were a bunch of press quotes that praised me as a songwriter. He read them and looked at me, tapping the jewel case with his nail, and said, “Don’t let them call you that. You’re a song performer, not a songwriter. You don’t write the song to sit there on a page. You write it to sing it.” He said “It’s not a song if you’re not playing it.” I’m not sure if I’m quoting him exactly right, but that’s my memory of what he said, and I hope I have it close to right, because that’s what I think about every time I play. Do you have a favorite Bob Dylan quote or lyric? No. It’s like children. You can’t pick a favorite. You love them all equally. Sometimes you feel closer to one, or more in sync with it, and other times, it switches. What are some of your favorite songs or albums, and why? It depends on my mood, or where I am. Blood on the Tracks, maybe. The Times They Are A-Changin’ has “The Lonesome Death of Hattie Carroll,” so I might pick that. But, if I had to pick one for an island, I’d take Biograph – that’s a cheat, I know. There’s something about Freewheelin, the flow of the songs. I take that in the car whenever I feel out of touch with reality. “The Lonesome Death of Hattie Carroll” is such a favorite song, because when I hear it, I feel like I’m there. Dylan creates a picture that has so much expression, you feel like you’re sitting inside a painting. You’ve just been painted in, and your heart weeps. What do you admire about Bob Dylan? The never-ending tour – how often he plays, how long he plays. How every time I’ve seen him play, it’s all new. He’s always creating, finding a new way into a melody, another way to phrase a thought. when he’s singing it to us. That’s what makes his songs timeless. Read more 30 Days of Dylan. 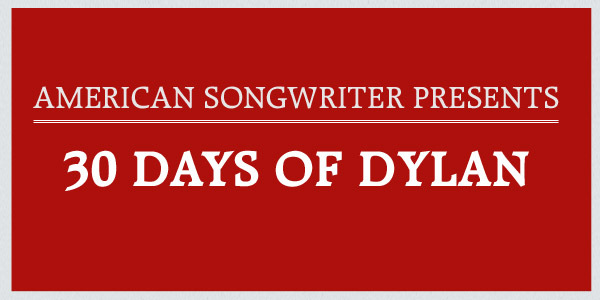 Visit Americansongwriter.com daily during our 30 Days Of Dylan countdown to read exclusive interviews with artists on Dylan, exclusive audio and video, and more.